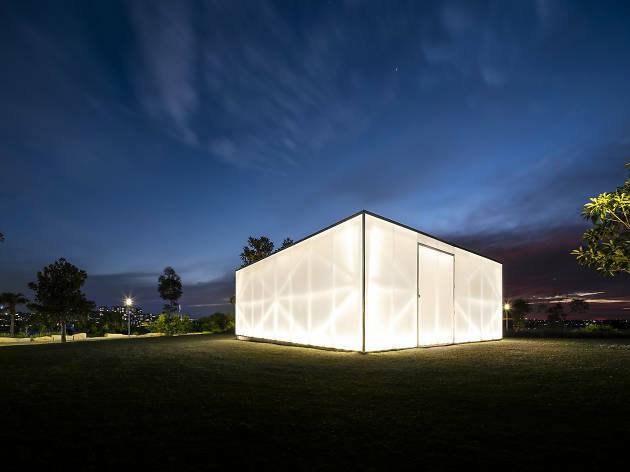 If you're hanging around the Blacktown Showground precinct in January, you might wonder what's inside the curious glowing white box. 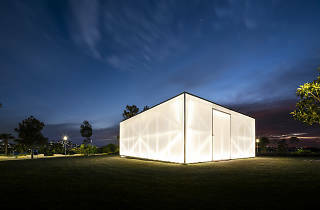 Called Blak Box, it's a pavilion for art and sound by the boundary-pushing Urban Theatre Projects, telling the stories of the Indigenous people who've lived in the area for tens of thousands of years. Audiences of up to 30 at a time can step inside the dramatic but minimally lit pavilion and listen to an immersive 55-minute audio track featuring spoken word, natural sounds and music, played in state-of-the-art surround sound. Blak Box – designed by Kevin O’Brien, a leading architect of Kaurereg and Meriam descent – made its debut at Barangaroo in June 2018, but it's heading west for Sydney Festival. And if you happened to catch Blak Box in Barangaroo, it's still worth heading along to this new season as there's a brand new audio program called "Four Winds". It's curated by Radio National host and Indigenous visual arts commentator Daniel Browning, and features stories from Blacktown locals, drawing on both oral histories and imagining a future for the area.